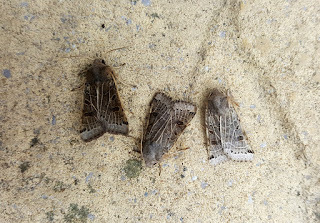 After a wet and cool day yesterday with temperatures struggling to reach 15c and with a minimum of around 7c this morning with a mixture of clear and cloudy spells the moth catch was a bit down on what I had hoped for, given how still the conditions were. Nevertheless a new species was recorded for the year, and not one but 3 individuals. Lunar Underwing is quite a variable moth but apart from one being lighter, the other two were near identical and they can be almost sandy coloured in appearance.